Welcome to the blog of onstream-guide.com. Please click on the links below to view earlier entries. A personal insight into nymphs and our imitations of them. We live in a jet set World. Most of us spend an increasing amount of time on planes visiting various places on the planet for work and or leisure. Modern fly fishing equipment is designed for travel. 4 or more piece fly rods, specifically designed luggage with the capacity to safely transport our valuable equipment and even with built in wet storage areas for boots and waders. The World is now our oyster like at no other time in the past. I've taken advantage of this and have fly fished wide and far, from the Himalalayan mountains to the trout streams of Alberta and the gushing Colarado in the USA. Most recently bonefishing during our honeymoon. Do some research. 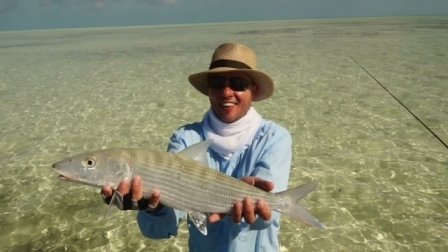 You may have heard that your Island destination is a Mecca for saltwater fly fishing but which area of the Island, from the shore flats wading or from a boat? These are questions you need to research before arrival. In this internet age, research is a lot easier than in the past. Even a question on a Fly Fishing Forum can reveal a wealth of useful information. Use the right equipment. Your 2 and 3 weight rods might be perfectly suited to trout in your stream but they ain't gonna cut the mustard with a running bonefish. Fortunatley there are independant outfitters out there who can provide you with all the right equipment. Rods, reels, lines, flies, stripping gloves and flats boots and most importantly advice. This was the UK company I used for my recent saltwater trip to the Carribean. Graham the gentleman in charge was excellent, gave me superb advice and provided everything I needed and it didn't cost a Kings ransom either. Around £300 for an entire saltwater outfit, flats boots and stripper glove. The latter is essential! I forgot this on one outing and ended up with a very sore and cut finger from a fiesty bonefish. Use a local guide. Sure you can go solo and save a lot of money but if you don't find the fish and are in the wrong place at the wrong time this is a false economy. A guide is essential for at least a day or two. You can ask him for advice on where to fish after the guided fishing ends. Any Guide worth his salt will be happy to provide you with this advice as part of his/her service. Be aware of legal requirements/parasite spread and prevention. In some countries a regional or National Licence is all that's required to fish inland waters (rivers and lakes). In others like the UK it can get quite complicated and in addition to a National licence you need a permit. Fish parasites are a serious issue. Make sure all equipment is thoroughly dried and if necessary disinfected before fishing in freshwater. Felt soles are being phased out and are banned in many places because they harbour immature stages of fish parasites. Be protected against sun and biting insects. Sunburn is not funny. Always wear a hat, good polarized sun glasses and sunscreen. In the tropics something to cover your entire face will be useful. You might find one of the best unsung trout streams in the World but if you are being eaten alive then you won't really care. Use a repellant and midge net if required (take it just in case!). Take nothing except pictures and leave nothing except footprints. OK if you are in Alaska or somewhere surrounded by fish by all means take 1 or 2 to eat. But respect local rules. If that means catch and release then fish catch and release. It is a sad sight in any country to find a pile of beer cans along a stream. By all means take a few to the stream but crush the cans carry them back and dispose of them properly or even better recycle them.